Summary: At a time in their lives when all are vulnerable, Natalie, Tricia, Miguel and Kyle find their friendships and attractions cause them more harm than good. Haunted by abuse in her past, Natalie’s influence poisons the others who are already close to the brink themselves. Expressing themselves through free verse poems often written as highly criticised English assignments, as their connections grow more twisted and individual histories are revealed, tragedy ensues. Even the careful interventions of the school’s guidance counsellor, Ms. Nishi, can’t prevent what becomes an inevitable ending. 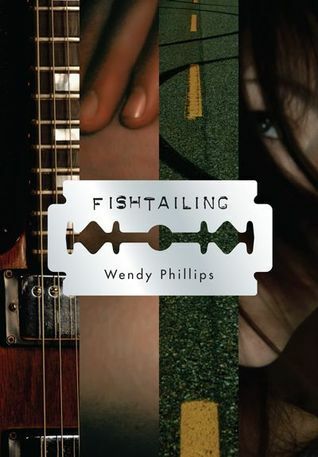 Review: Told through the perspectives of six different people in a free verse format, Fishtailing by Wendy Phillips is the story of three teenagers all caught up in the games of one young woman with severe issues of her own. I enjoyed the contrast between adult and teen perspectives, and while I didn’t find her to be the most likeable character I did feel empathy for Mrs. Farr in the end. She projects a rough exterior, but reveals the students she teaches do deeply affect her. Ms. Nishi on the other hand, is an obviously compassionate individual. Though she does everything she can in her position, the story still fishtails with manipulation and death. It’s the title I love the most. Fishtailing describes when a car’s back wheels lose traction, prompting the driver to oversteer in an attempt to correct the situation which can result in a spinout. This is exactly what happens in Phillips’ book with Natalie being the metaphorical low friction surface that starts all the trouble. Fraught with hardship, it is easy to see why Tricia and Miguel fall under Natalie’s spell. Natalie may not have a good understanding of herself, but she knows how to get what she wants, even if it will ultimately hurt her. Fishtailing is a heart-rending tale, and a quick read. through the underwater viewing window. Fishtailing by Wendy Phillips is published by Coteau Books, (2010).